Sir Prof. Harry Kroto, Dr's David Walton, Roger Taylor, Adam Darwish, John Dennis, Jonathan Crane, Paul Berket, Bernd Eggen and Steve Firth, Jan Meering and the fullerene Group at the Angmering School (Worthing, West Sussex, UK), Roddy Vann of St Paul's School (London), Sarah Hogben, Gill Watson, Caroline McGrath and the expertise and skill of our departments mechanical engineering workshop. References, notes and other information - fullerene facts and figures, properties of carbon, scientific papers and notes, information on equipment suppliers. C60, Buckminsterfullerene  the third allotropic form of carbon was discovered in tiny quantities in 1985 by H. W. Kroto (Sussex Uni., UK) and R. E. Smalley (Rice Uni., USA). In 1990 a method was developed to make C60 (and the family of carbon cage molecules - the fullerenes) in gram quantities. Fullerene science has now become a rapidly growing field of research . It is also having an impact in schools, colleges and science education. By 1995 several schools had actually designed and built their own fullerene generators . It is these exciting developments in the fullerene story that have stimulated the following article. This article briefly describes the fascinating experiments that first uncovered the fullerenes and the subsequent techniques used to make bulk quantities of them. Also included are detailed notes on designing a fullerene generator (which will be of use in schools and colleges as well as in universities). 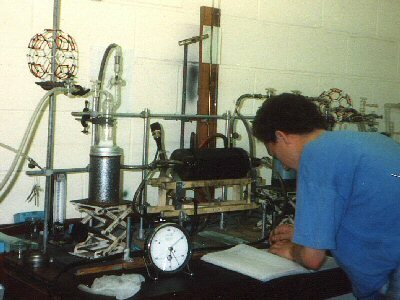 In particular a stainless steel reactor is described that can be used to make gram quantities of C60 per day. The design can be fabricated in a well stocked mechanical workshop in a few days. C60 and the fullerenes were discovered on a versatile and ingenious piece of equipment called a cluster beam apparatus [1,2]. The beam experiments were essentially very simple; an element (in this case carbon - graphite) was rapidly heated (under vacuum or inert gas) by a high power laser, reaching temperatures in excess of 10,000 °C - hotter than the surface of the Sun. The vaporised products were then analysed using a sensitive mass spectrometer. An additional refinement of the experiment was that the laser vaporised products were rapidly cooled before being fed into the mass spectrometer, this 'froze' out the reactivity of the various species produced. Without this many of the species produced would rapidly go on to form larger systems with their neighbouring vaporised atoms and molecules. The technique therefore takes a sort of 'snap-shot' of the initial products of the vaporisation. The heart of the cluster beam apparatus was the mass spectrometer. This device separates out all the products in terms of their mass and displays the result in the form of a graph. This spectrometer makes the machine versatile and exquisitely sensitive. When carbon was analysed using this apparatus a whole range of structures (clusters of atoms) were observed, in fact the spectrum of carbon was just about the most interesting of all elements. Atoms, small molecules, large molecules, small particles, large particles and graphite fragments were all observed. At first sight it was obvious that a random mixture of products were produced by the laser vaporising the graphite. On closer inspection, certain sized clusters of atoms appear to be more abundant, stable and resistant to reaction than others. These 'magic' numbered species were shown to have the closed shell structures - the fullerenes - with C60, Buckminsterfullerene (the football molecule), usually being the most dominant [1,2]. There was really only one problem in these fascinating and important experiments, and that was due to the amazing sensitivity of the spectrometer. You see, on the one hand this allowed the fullerenes to be first observed (under formation conditions that were probably far from favourable) but on the other hand it also meant that only tiny quantities were actually being produced at any one time. The machine was capable of detecting nanograms of C60. A rough calculation shows that even if one runs the cluster beam apparatus for ten years or so, - non stop - one would barely produce enough C60 to line the bottom of a test tube (perhaps only a few milligrams would be produced). This amazing technology therefore puts us in a rather tantalising situation; it allows us to make new discovers but then leaves us with the problem of being able to make large enough amounts to be able to do anything with. Therefore the promising new area of C60 science (for example the physical and chemical properties) would have to wait until we could make large quantities - at least on the milligram scale. 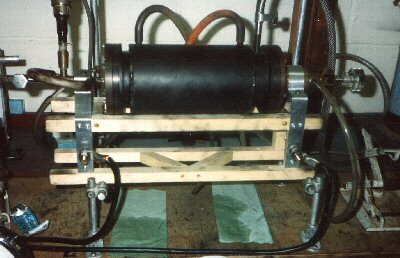 The solution to this dilemma came about with the breakthrough made in 1990 by W. Krätschmer and D. R. Huffman (a German-American team ) and to a certain extent the Sussex University team [2,5]) using apparatus that might well have been available back in 1890 ! Unlike the expensive high-tech cluster beam apparatus that discovered the fullerenes, the apparatus that first produced gram quantities of C60 was incredibly simple. Bulk quantities of C60 were first produced using a carbon arc. The technique works like this, Two high purity carbon rods (roughly 5cm long and 0.5cm diameter) were supported so that their ends just touched. This rod system was mounted inside a glass bell-jar. The bell-jar was evacuated and filled with helium (or argon) to 100 Torr (roughly a seventh of an atmosphere pressure, 700 Torr = 1 atm). A large electrical current (20 volt at about 100 amps) was then passed through the rods, developing a bright arc-discharge between them. This was maintained for about 10 - 20 seconds during which time the arc sputters black soot like material throughout the jar. After letting the apparatus to cool down the bell-jar was opened up and the soot scrapped out. The type of deposit found inside the bell-jar depends critically on the inert gas pressure. Under vacuum a hard, shiny brown graphitic layer was deposited which was difficult to remove. Introduction of only a small amount of inert gas dramatically changes the type of layers deposited. For fractions of a Torr of helium, the deposit settles as a fine jet-black powdery soot layer or film, which can be removed without difficulty. The soots remain jet black until the gas pressures reach c.a. 10 Torr, where the film develops a dark brown hue. On closer inspection these films appear to have a crystalline component, adding a slight sparkle to the dull soot layer. Similar results are obtained for argon, although the transition pressure is a little higher. Providing the rods were fairly pure (better than a few % purity, ie. no sulphur content) and that no air leaked into the jar during arcing, 5 - 10 % of the soot produced in this arc treatment is actually C60. Its as simple as that ! The next step was to try and extract the fullerenes from the arc materials. Adding toluene (or benzene, hexane, chloroform, carbon disulphide etc) to the soot and leaving the resultant mixture to stand for a few hours, we find that the fine suspension of soot particles will settle and the solvent will have turned red (this was first done at Sussex 6 August 1990, [2,17]). Mass spectrometry shows that the solution contains C60 and larger fullerenes. Solvent extraction of the fullerenes is therefore possible. Analysis shows that C60, C70 and traces of the larger fullerenes make up roughly 80, 20 and less than 1 % of the isolated material respectively . It is this solubility which allows the fullerenes to be separated effectively by chromatography (see below) and enables chemical reactions to be studied systematically and conveniently. Improved fullerene yields were obtained using an ingenious device called a Soxhlet extractor [5,6] see diagram over the page. The soot was loaded into a thimble (typically ca. 2 - 3 g of soot; 100 x 30 mm thimble) and placed into the extractor. Hot solvent condenses and drops on to the soot, dissolving the fullerenes. Eventually a siphon arrangement draws the saturated solution away so that a fresh batch of solvent can further extract the soot. In this way the maximum amount of soluble material can be extracted. Because of the toxicity of benzene one generally uses chloroform or toluene. Although fullerene solubility might be slightly lower in these solvents it does not hinder the extraction process significantly because the soot is washed many times. Extraction of c.a. 3 grams of soot takes about 2 - 3 hours, and is judged to be complete after the colour stops leaching from the thimble (although small traces of the larger fullerene > C70 may well take 10's hours to remove completely). Using this method 5 - 10 % of the soot was found to be soluble, where the majority of the extract are fullerenes. The extract solution can then be evaporated to give a brown-black solid. This extract is washed in acetone to remove hydrocarbon impurities which may be present from the solvents. After repeated chromatography, solutions of relatively pure C60 and C70 can be prepared (better than 95 percent pure by spectroscopy). The solvent can be evaporated to leave the solid fullerene. However, the dry solid still contains a significant quantity of solvent trapped in the crystal lattice. For example, IR (Infrared) spectroscopy of thin films of C60, show benzene peaks when evaporated from this solvent. Whatever solvent one uses there is always trapping in the crystal lattice (perhaps a few % of the mass). One can substantially reduce this by baking the fullerenes at 550 K for several hours under vacuum (< 1/1000 Torr). However, defect-free samples of the fullerenes can only be made by subliming the samples (i.e. heating at ca. 800 K and collecting the sublimate) and then heating for days at a constant temperature (c.a. 600 K) under vacuum. In this way samples can be annealed to produce material of high quality. Various groups around the world have designed and built their own fullerene generators, and some of these are summarised in the table below. The 'soot g' column records the total amount of collectable fullerene soot made in one operation (i.e. each time the apparatus has to be opened up), and the yield column records the amount of fullerenes extracted from these soot's. Gas pressures are in Torr. Note: the laser and induction generator results appear very poor, but one must remember that these were only preliminary experiments conducted to confirm that they could be used for making fullerenes, and were not designed for mass production. Scrivens et al. , DC, 450, ~1, 12, plasma discharge. 1) Best fullerene yields are obtained using helium pressures of about 100 Torr (i.e. ~1/7 atmosphere), although this depends, for example on the size and shape of the generator (note: argon gives slightly lower yields than helium). The gas pressure is therefore less than atmospheric and so a 'vacuum tight' chamber is necessary. As a rough guide the system should be able to pump down successfully to c.a. 1/100 Torr and hold this sort of vacuum for several minuets (when isolated from the pump). 2) Large chambers may be better than smaller ones. Helium flow experiments aimed at keeping the pressure inside the apparatus constant while the high temp arc operates, have been conducted and the results produce slightly higher C60 yields than static systems. In these experiments helium is carefully flowed into the chamber at the same rate as it is pumped out. The effect of the flow is that the system remains at a constant pressure even though the internal changes in temperature (when the arc is running) are large. However, fast flows can cause the fullerene production to cease all together. The change in pressure produced by the heating effect of the arc may be responsible for lower fullerene yields. Larger chamber may be better at coping with the pressure changes and therefore give better yields. 3) The carbon arc reaches temperatures in excess of c.a. 4000 K (the arc melts tungsten) and so the rod-supporting apparatus and the chamber must be designed to cope with the high temperatures (and large changes of temperature) while still remaining leak proof. A steel vacuum chamber with integral water cooling is therefore ideal. A glass bell-jar must therefore be used with care and can only be used for limited periods. 4) The apparatus must be made so that it can be easily dismantled allowing the soot to be removed and / or the rods to be replaced after vaporisation. 5) The apparatus must be designed with due regard to the different electrical potentials of the rods. Usually some kind of insulation is required (especially on the steel chamber generators). Nylon bolts may be required for the flanges (at least on one side of the chamber). 6) A two-rod system can be set up when using an AC supply provided that equal pressures are applied to both the rods when they are pushed together to be vaporised. If this is not done one rod will burn in preference to the other. Eventually, if this is not corrected, the rod will continue to burn back and possibly ruin the apparatus. Also the rods need to be coaxial otherwise they will pass over each other and limit the vaporisation, or more seriously damage the apparatus. One will then need to open the apparatus and replace the rods. b) the arc cannot wander, as experienced in the two-rod system, and also if the block is made sufficiently large, there are non of the coaxial problems associated with the two rod design. However because only one rod is vaporised, the DC system produces about half the soot of the two-rod system. 8) To increase the amount of soot that can be collected each time the apparatus is opened up, the design could include a) a system where many rods can be inserted into the generator one after the other (preferably from the outside, so that the apparatus need not be dismantled each time), or b) a system where many rods are fitted internally and used a pair at a time. 9) High grade carbon rods (often called 'spectroscopic grade') were used for all the experiments which have well known and guaranteed impurity levels. However, even the cheapest 'low' purity types of these rods (which have less than 1 % impurities) were found to give the same C60 yields as the highest purity. Expensive high grade rods are therefore not necessary. Some details of companies who sell rods are given at the back of this booklet. 10) Some comments on the helium gas. On the whole helium is better than argon. One school I know actually took the helium out of fair-ground type balloons ! Although this was a good idea it is very hard to get the helium into the generator without letting some air leak in. Finally, I am not sure about the purity of the gas in the balloons - anyway you could try it ! Usually one has to rent a small cylinder of helium from a gas company; the helium itself is not too expensive but the rental and deposit on the cylinder can be costly. If you are really stuck you can try argon from a welding torch set. Again, I am not sure about the purity but a friendly builder, iron monger may let you try it for free. 11) A low voltage high current supply is needed to successfully vaporise the graphite rods. This will depend on the diameter of the rods; 20 - 30 volt at 100 amps works well for ~5 mm rods. A heavy duty car or lorry battery (12 volt or higher) can be used for these experiments, but they will need to be continually recharged (possible overnight or longer). This obviously limits the versatility and amount of material that one can make in a day and so a mains power supply is really the only practical solution. We use a welding kit power supply that provides an AC output of ca. 40 - 50 volt at about 100 - 150 amp. DC supplies can be used but only one of the rods will be vaporised (see (7) above). Using the bell jar apparatus with a two rod arrangement (5 - 10 cm length, 5 mm diameter) for five experimental runs (about a days operation) produces about 0.5 gram of soot (roughly containing 25 mg C60). In order to generate greater quantities of soot (and therefore C60) an improved soot generator was designed. On the basis of the points mentioned above a simple generator was designed and built . In order to produce a simple working system a two-rod AC system was constructed. The design can be machined in a workshop in a few days. The carbon rod vaporiser is shown over the page. It consists of a water-cooled stainless steel chamber (200 x 100 mm OD), fitted with four ports. Two flanges, mounted on either end of the chamber, are electrically insulated by plastic (teflon for example) spacers and nylon bolts. The chamber is vacuum sealed using O-rings either side of the plastic spacers. The end flanges consist of a water-cooled jacket which surrounds a hollow tube down which a carbon rod can slide. The carbon rod is vacuum-sealed on the outside of the flange by an additional O-ring seal. With this arrangement the carbon rods can be quickly fitted into the apparatus from the outside without having to dismantle the whole machine. The rods slide down the water cooled jackets and pass into the chamber where they touch one another near the centre of the chamber. 305 mm long rods were used (Le Carbone, Purity 8, 4.6 mm diameter ), and so the amount of soot that can be made in one go, is thus greatly increased over the bell jar. A high current low voltage welder power supply (max. 50 volt AC at ca. 150 amp ) was used and connections to the rods made via the metallic end flanges. Although this means that both the end flanges are live, the voltage of the welding power supply is low enough (c.a. 30 - 40 volts on load) that it does not represent an undue hazard. Note: the apparatus should be rested on a non-conducting surface, otherwise the flanges may short circuit. The apparatus was assembled and all ports and water cooling pipes fitted. The carbon rods were then inserted into the flange holes provided. The O-ring seals were gently tightened so as to obtain a good seal but also allow some lateral movement of the rods. The rods were then pushed-in to equal distances so that they meet midway inside the chamber. They were then separated very slightly (ca. 1 mm). The tap to the vacuum pump was opened and the chamber pumped down to c.a. 1/100 Torr (this operation takes about 10 minuets depending on how good the pimp is). The pump valve was then closed and the chamber filled with helium (via the inlet valve) to almost atmospheric pressure. The inlet valve was then closed and the chamber pumped out once more. This procedure was repeated a couple of times to purge air and moisture from the system. The cooling water is then allowed to run for a minute or two to eliminate air locks. Helium (c.a. 100 Torr) was then fed into the chamber by carefully opening the inlet valve and monitoring the mercury manometer. The power supply was turned on; no current should pass if the rods have been correctly aligned, as described above. The commercial welding power supplies tend to be simple devices (ideal for this application) and switching-on produces a low frequency buzz from the transformer. When contact is made (and large currents pass) the buzzing sound increases dramatically so providing a crude, indication that contact between the rods has been made. The operator should use plastic gloves as this gives some electrical insulation and a good grip when adjusting the rods. With the power supply turned on, one of the rods was advanced slowly so as to make contact with the other. The power supply then makes a rasping sound which indicates that the arc has been struck between the rods. It is a good idea to start a clock at this point and allow the arc to continue for about 20 to 25 seconds. After this the supply is turned off and the apparatus is allowed to cool for a couple of minutes. The main chamber becomes very hot while the arc is running (even with good water-cooling) and a cooling down period is necessary to prevent damage to the system (in particular to the O-rings and insulating spacers). After cooling, the process can be repeated, but this time by pushing in the other rod to strike the arc. By alternating the movement of the rods, the arc remains roughly central and then one rod will not tend to be vaporised in preference to the other. While the arc is running, the chosen rod can be pushed in by hand to speed up the whole process (10 - 15 mm for each 20 sec. vaporisation's). A pair of rods lasts about 10 to 20 such operations. It is worth noting here some of the problems which can be encountered when using the apparatus. If the rods are pushed in too fast (ie. > 15 - 20 mm per 20 second vaporisation's) a deposit builds-up on their ends. This increases the surface area of contact which reduces the current density, which in turn reduces the amount of vaporisation and therefore lowers the efficiency of the whole process (also point 6 should be noted here). The best way to prevent this happening is not to try and rush the vaporisation process; that is, not to push the rods in too quickly. One can tell if build-up is occurring because the power supply tends to pass a more steady current and the noise from the transformer changes from a rasping tone to a continuous loud buzz. If this happens one can ether open-up the apparatus (as described below) or try and break off the build-up by carefully pushing the rods together and twisting them in opposite directions (this time with the supply off). Assuming that all goes well and the available length of each rod has been fed in to the apparatus, the system can be opened. The most convenient way to do this is to disconnect the water cooling tubes and place rubber bungs on / in the inlets and outlets (this prevents a horrible mess when it is time to dismantle the whole apparatus .ps. tell me about it !). Next, open the vacuum pump valve slowly so as not to dislodge too much of the soot inside. Leave the pump to evacuate the system for ten minutes or so. It is advantageous to do this for two reasons; firstly, any toxic gases which may have been produced in the arc (by an air leak for example) can be removed safely, and removing the gas tends to compact the soot into a crusty layer which is far easier to remove later. After pumping out, the vacuum tap should be closed and the helium inlet valve carefully opened so that the apparatus slowly regains atmospheric pressure. The connections to the ports can then be removed. The chamber and flange assembly will still be bolted together but with little or no rods protruding and no pipes attached. The soot is removed simply by scraping it from the inside of the apparatus. The best way to do this is to remove one flange and place a piece of paper over the open end of the chamber, holding this in place the chamber can be laid on its end and any loose soot is thus confined by the paper. The second flange (now on top) can be removed and the soot deposited on the flange can be scraped into the chamber (which now acts as a ready made holder). Finally a long spatula can be used to scrape the soot off the walls of the chamber. Lifting off the chamber leaves a pile of soot which can be bottled or loaded straight into a Soxhlet thimble. It is advisable to have the whole apparatus mounted inside a fume cupboard, thus reducing the amount of soot dust. This precaution also protects the operator from the possible toxic nature of the soot dust. A face mask and disposable hand gloves also provide protection and should always be used. The collected soot can now be extracted and the apparatus re-assembled making sure to clean the O-rings and spacers so that a good vacuum seal can be obtained. Some experimental suggestions you might like to consider for improving the fullerene yields. Although the fullerenes must be formed from matter condensing from the carbon arc plasma, it was suspected that UV and heat from the arc might decompose the fullerenes once formed. A screen arrangement near or around the arc may be useful in protecting the deposited soots. Lower arc currents (<100 amp) were tried by reducing the voltage to the power supply, via a high power mains Variac. This was found to reduced the amount of material vaporised. On the whole, yields were poorer at these lower currents. Experiments using very high currents (100 - 300 amp) might be worth trying to increase the fullerene yields (or the distribution of the larger fullerenes). Playing around with the length of time for which the arc was maintained during each vaporisation may effect the distribution of the fullerene produced and also the yields. For example ten 30 second arcing may give different fullerene results to say, one hundred 3 second arcs. In our experiments a DC arc was found to produce roughly the same yields as an AC arc (of similar voltage and current). However, in our experiments we simply full wave rectified the AC voltage from the welding kit power supply. No regulation or smoothing was applied and so the current was not strictly DC; it effectively behaved as a 100 Hz pulsed DC system rather than as smoothed DC. A car (or better a lorry) battery may work, although you will have to recharge them regularly. H. W. Kroto, J. R. Heath, S. C. O'Brien, R. F. Curl, R. E. Smalley, Nature, 1985, 318, 162. Angewandte Chemie, 1992, 31, 111 - 246. J. P. Hare, Sussex University, C60 and Schools, Past Sixteen Science Issues, Feb. 1996. W. Krätschmer, L. D. Lamb, K. Fostiropoulos, D. R. Huffman, Nature, 1990, 347, 354. J. P. Hare, R. Taylor, H. W. Kroto, Chemical Physics Letters, 1991, 177, 394. Journal of the Chemical Society, Chemical Communications, 1994, 15 - 16. Advanced Series in Fullerenes, Vol. 1, World Scientific Publications, 1993, ISBN 981-02-1117-1. A vertical rod-block generator with a large volume (ca. 10 litre) stainless steel chamber. R. E. Haufler, Materials Research Society, Symposium Proceedings, 29th Nov. 1990. J. C. Hemmiger, D. M. Gruen, L. M. Stock, Journal of the American Chemical Society, 1991, 113, 7499. A. S. Koch, K. C. Khemani, F. Wudl, Journal of Organic Chemistry, 1991, 56, 4543. G. Peters, M. Jansen, Angewandte Chemie, International (English) Edition 1992, 31, 223. R. E. Haufler et al. Material Research Society, Symposium Proceedings, 1991, 206, 627 - 637. K. Yoshie, S. Kasuya, K. Eguchi, T. Yoshida, Applied Physics Letters, 1992, 61, 2782. W. A. Scrivens, J. M. Tour, Journal of Organic Chemistry, 1992, 57, 6932. J. P. Hare, PhD Thesis, University of Sussex, Chemistry and Molecular Sciences, 1993. Le Carbon, South Street, Portslade, Brighton, East Sussex, BN41 2LX. Tel. 01273 415701, Fax. 01273 415673. Purity 6 rods, 4.6 mm diameter x 303 mm long, ca. £ 200 for 100). Agar Aids Ltd, 66a Cambridge Road, Stansted, Essex, CM24 8DA (for small high purity rods, Type E340, 5 mm diameter x 50 mm ca. £10-00 for 10). Toluene need not be high purity. Fissons may sell an appropriate column Carbon granules from; Norite Ltd, ELORITE grade, carbon granules, sample number A-8160, Norit N. V., Postbus 105, 3800 AC, Amersfoot, The Netherlands. RS components, Turboweld 8, SN 623-271, page 3-3125 Radio Spares Catalogue or borrow one , have one donated, or steal one from a builder, ironmonger or garage. or try a fully charged car battery.